Happy Earth Day! Well, really every day should be Earth Day but its nice to have a special day set aside. I think nature is helping us feel more like celebrating too because….no snow/ice/hail/rain has descended on us as it did last weekend! Yikes! So when we reflect on what we can do to help sustain our planet it’s pretty obvious that we are drowning in waste especially plastic and that is a main focus for us here at Sustainable Cobourg. We are hoping to redirect people’s thinking to substitute words like ‘garbage’ and ‘waste’ to LANDFILL, because that’s where it all ends up (or the oceans , lakes, rivers and streams). It’s polluting and dangerous. Not just because of the methane gas that is produced which is one of the contributing Greenhouse Gases that is interfering with regular climate patterns, but also because it pollutes our environment and by ‘our’ I don’t just mean human beings! We are hoping that some of you will help do something, not in a big way, but in an important way, to deal with getting rid of the ‘garbage’ in our Town. 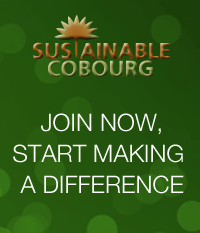 On April 28th Sustainable Cobourg will join the Town’s “Pitch-In” program. Please join us if you can. We meet at Victoria Hall Lobby at 9:00a.m. If you know you can come please contact Sustainable Cobourg so we can inform Renee Champagne about how many of us there will be. Another event that we’re excited about is our ‘All Candidates Forum’ on May 30 at 1185 Elgin St. from 7:00 p.m. I’ll write more about that later. We have confirmed that 5 candidates will attend: Liberal, Lou Rinaldi; Conservative, David Picinni; Green, Jeff Wheeldon; NDP, Jana Papuckoski; Trillium, Derek Sharp. A full slate!